It's been a while since I've literally been around Manila. Despite the intense heat during that day, it was a delight to revisit what this old city has to offer. 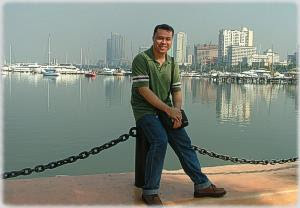 I started out the day having breakfast at Pancake House over at Harbour Square, which has a magnificent view of Manila Bay, The Manila Yacht Club and the stretch of buildings along Roxas Blvd. At this time of day, the coastline is reflected on the bay causing a beautiful mirror image effect. After breakfast, I headed to my intended destination of business for the day, the Bureau of Immigration. Since the main building has suffered a severe fire a few years back, the Immigration is now split into 3 different buildings. And you have to go back and forth to these buildings while you're there. Even though it was chaotic, being around people of different races and countries makes you realize the true meaning of belonging to a global community. The goverment facility closed for a lunch break and I went around the to the nearest restaurant to have lunch myself. It was a hot 5 minute walk and I happened to pass by some monuments. One is the Centenario de la Expedicion Maritima Mexico Pilipinas. This is first time in a long time that I've heard the word Expedition not referring to the Ford SUV. This was situated in front of the river leading to Manila Bay. Unfortunately, there was some graffiti in this historic monument. Finally, I was able to escape the hot sun when I entered Max's Restaurant which is very near the Manila Cathedral within the Intramuros area. I'm not sure, but this may be one of the oldest Max's restaurants in existence. I noticed that there was a lot of memorabilia in terms of photos of how Max's Chicken started out. There were some pictures of the old exterior on the walls close to the ceiling. 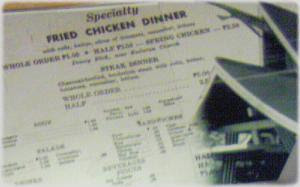 Interesting to note was a picture of Max's menu from half a century ago. The price of an entire whole friend chicken dinner was only P5.00 which included rolls, butter, corn and asparagus (I think). The menu was predominantly American. Rice then wasn't a standard entry in their menu and various kinds of sandwiches were on the menu instead of the newer and current favorite Filipino entries (kare-kare, sinigang, pancit, kamaron rebusado etc). During lunch, I got a a text message from a colleague asking me if I could send a picture I took the night before to be used in an entertainment column for Manila Bulletin. Good thing I had my laptop with me and tried to send the file. Unfortunately, I couldn't seem to send it. So I was thinking of submitting it directly to their offices since they're also located within the Intramuros area. However, I had a strict schedule that day which couldn't permit me to add another appointment. And so I decided to look for an internet cafe instead. The only place I could think of was along Pedro Gil. I took the Luneta scenic route going there and saw some Korean tourists having their picture taken in front of Jose Rizal's statue. I made a wrong decision in which street to take going to Pedro Gil as I took the jeepney route and passed through Del Pilar street. It was chaotic cause all the jeeps were taking their time seeking passengers. It gave me time to notice the surroundings in the area. What used to be a red light district seemed to be abandoned leaving only the establishments minus the lively nightlife. It was daytime though and so the sidewalks were filled with vendors instead. 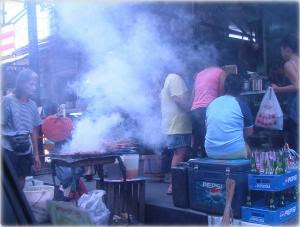 While waiting for the stoplight to turn green, what suddenly seemed like fog was actually smoke from street food being cooked to the left of me - Barbeque to be exact. Approaching the Adtriatico area, I saw a huge construction. What used to be the former location of Manila Midtown Hotel is now an expansion phase of the Robinsons Place Mall. I used to frequent the area as I worked several years ago for Samsung whose office was located nearby. Unfortunately, the internet cafes I saw didn't have any decent parking spaces so this trip to Pedro Gil became more of a tour. Due to my strict sched, I had to leave the Manila area and head for Quezon City and Cainta to continue my schedule. Spending half of the day in Manila though was still a treat and a change of scenery for me from the busy business districts of Pasig and Makati. Quoting the Hotdog classic, "Manila.. Manila... I keep coming back to Manila..."
Masaya nga sa Manila, especially at Harbour View. Try hanging out there in the evening. Masaya!